Major economies slowed. In 2018, many of the world’s large economies began to lose steam (or even come to a halt). While the economic challenges in Latin America and some African countries have become familiar in the past few years, 2018 saw China’s GDP growth dip, as well. This has had a direct impact on smartphone demand in China and has affected the overall global smartphone picture. Smartphone penetration in key markets reached saturation. Smartphone demand has slowed due to market saturation in most North American and European countries, so the primary opportunities there stem from device replacement (“replacement opportunity”). 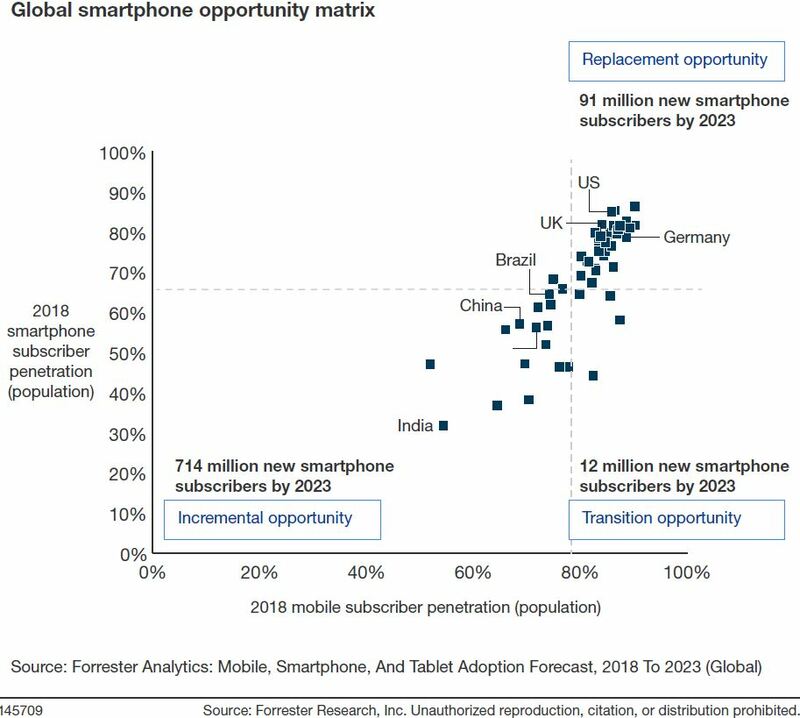 Forrester forecasts that these economies will add no more than 91 million new smartphone subscribers — just 11% of the total number of new smartphone subscribers that will be added through 2023. Moreover, increased prices mean that consumers will replace their phones less frequently, further slowing smartphone demand. The decline in smartphone sales has hit Samsung and Apple the most. By the end of September 2018, Samsung’s mobile revenue had declined by 5.4% year over year and is not expected to improve until 2019. As of September 2018, Apple’s smartphone revenue had increased by 21% year over year, but unit sales increased by just 1% — making an increase in device price, rather than incremental improvements in device shipments, the likely source of Apple’s revenue jump. This doesn’t seem like a sustainable strategy in the long term. Transitional. In these countries, mobile penetration is already at mature levels. Opportunities to add new subscribers are limited. Increases in the number of smartphone subscribers come from feature phone users moving to smartphones. Replacement. These countries have advanced telecom markets and a significant number of subscribers owning more than one smartphone. Device replacement is the primary opportunity available to handset manufacturers. Incremental. In these countries, the increase in smartphone subscribers is due to both new subscribers and feature phone owners moving to smartphones.